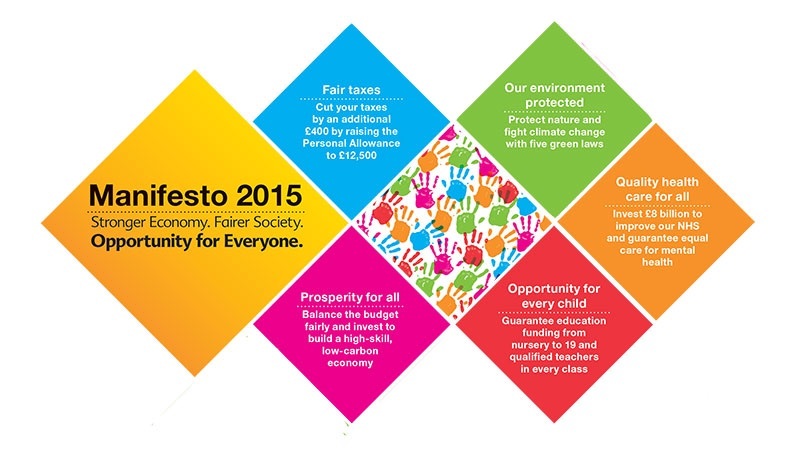 The Liberal Democrat manifesto was a UK election first. It was the first time that a party has actually campaigned on the basis of a hung Parliament. Rather than telling the use what they would do if they were in charge of the country, the Lib Dems, particularly at their launch, were most eager, and have been most eager throughout this election campaign, to tell us what they would stop the other mainstream parties from doing should they enter coalition with them. As Nick Clegg, the Liberal Democrats in Government would give the Conservatives a heart and give Labour a brain. Meanwhile, Danny Alexander asked us whether whose hands we would like around the throats of the next government: Nigel Farage, Alex Salmond, or to have the Liberal Democrats helping to maintain the strength of the economy in a fairer way. We therefore end up with an interesting situation where the importance of the manifesto could be said to be high or low. To some people the manifesto pledges that the Lib Dems have made are somewhat inconsequential, as people now know they will be giving up a lot of them in government. This may explain why they were mentioned so few times in the ‘Challengers’ debate, featuring the opposition leaders, that the most sober person in the country was whoever had ‘Liberal Democrats’ in their debate drinking game. To others this manifesto is important, because unlike the smaller parties, some of it could well become law, as they are likely to end up in coalition. Being the only party that will deal with both Labour and Conservatives gives them an advantage here, and this is why I believe this manifesto is important. The language used throughout the document is pointed. Unlike previous Liberal Democrat manifestos, they have a track record in government to point to. They are able to talk about policies that they fought for (pupil premium, rise in personal income tax threshold) and also they are able to talk about policies they have fought against (the attempt by Michael Gove to have two different classes of GCSE) . They are also able to talk about ways in which they worked to water down the more contentious Conservative proposals and policies, and will continue to work to do so, talking about amendments to the ‘bedroom tax’ and how they made sure that tuition fees were only payable after university was finished and only after a certain income was reached. On the other side of the political spectrum, the Liberal Democrats are very clear on how they would prioritise the paying off of the deficit more than Labour would, aiming to pay off the ‘current deficit’ (everyday spending, not capital investment) by 2017-2018, much earlier than Labour. The document is clear that they would try and make a Labour-led government more financially responsible. In health care, the Lib Dems have been talking for a while now about their planned extra yearly £500m investment to try and make mental health care as accessible as physical health care. It is worth remembering that mental health problems are reckoned to cost the UK over £100bn a year so proper planned investment in this will be very much worth it. They are also the only party to commit to providing the £8bn of funding the NHS’s leaders say is needed to keep it strong AND actually explain (unlike the Conservatives) how they would fund that. That said, much of the information on how they would fund it is, shall we say, rather “bitty”, with lots of little ways of raising revenue as well as simply increasing funding in line with growth from 2017. It is worth noting by the way that David Nicholson, the former Head of the NHS has pointed out that the extra £8bn a year is needed NOW, not in 2020 as both the Conservatives and Lib Dems have planned to do. On the Environment, the Lib Dems have written more than any other party, bar of course the Greens. They have always been highly environmentally aware, and here they introduce Five Green Laws (Nature Act, Resource Efficiency Act, Green Trasport Act, Zero Carbon Act and Green Buildings Act) which would help the country move further towards achieving their Climate Change targets, but also further towards simply making Britain a cleaner and greener country. This may make it possible for Green voters in marginal constituencies to feel more comfortable voting for them, although I would imagine their position within government may make that unpalatable for many a Greens. From an ideological point of view it is striking how little the Liberal Democrat manifesto owes to Liberalism. It isn’t until page 101 that they mention Liberty, and much of the manifesto contains an increasing amount of government regulations and encroachment into peoples’ lives. This may be justified by Lib Dems as being about increasing equality of opportunity, but ultimately it speaks of a party that has crept further and further to the left over the past 40 years and have spent the last five years clinging grimly onto a Conservative party that itself is being pulled further right. Just when you thought this nakedly political manifesto was over, up pops perhaps the clearest example of the lessons the Lib Dems have learned from the last five years. It is buried deep, on page 130 of 158, but there it is. Back in 2012 the Lib Dems, upset that the House of Lords reforms that they thought were part of the Coalition agreement (which actually only promised a review), and the conduct of the farcical Av referendum in 2011, said they would vote against the constituency reforms that would reduce the number of MPs to 600 and equalise the constituency boundaries so that roughly the same amount of people are in every constituency. Thus the Tories were not able to push through changes, which, although perfectly fair, and although were what should happen when population living patterns change, would also have gained them about 30 seats. The Lib Dems have now ‘weaponised’ this constituency boundary change and reduction of MPs, by including it “as part of the introduction of a reformed, fair, voting system”. This just after they explain that they want Single Transferable Vote (STV – click here for a video about that) as the election system, which would deliver a more proportional vote to seat ratio whilst maintaining an MP constituency link. They are very unlikely to get the latter, so the stories are very unlikely to get the former. Unless…..
That’s the point, we just don’t know what they will stick to, and what their ‘red lines’ are. We will have to wait for the Coalition Agreement to find out.